Waiting in for parcels will now be a thing of the past, as you can now get parcels delivered to the lockers located on the 3rd floor of our car park and collect at a time which is convenient for you. With the car park open from 6am until 11.30pm, those coming to collect their Amazon parcels will receive a grace period of 15 minutes free parking. David Robinson, our Centre Manager, said 'Riverside is continually looking to enhance the range of services we offer our customers and so we are pleased to be able to add the Amazon Locker service. The facilities is easily accessible on the 3rd floor of our car park with 15 minutes free parking available for those using the service'. 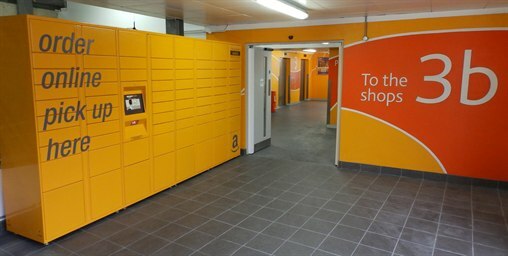 The Amazon Locker needs to be added to a customer's address book by visiting www.amazon.co.uk/addosrick, which can then be selected as the delivery address when ordering. All parcels delivered to the Amazon Locker must be picked up within three business days, or they will be returned to Amazon and a refund processed. A selection of stores at Riverside also offer a FREE Click & Collect services to online shoppers, including Debenhams, Topshop, Topman, Clarks, Next & Waterstones!